This table lists the materials needed to convert your spraywand to the TeeJet system. No endorsement is implied for products and manufacturers listed here. Resources are listed for informational purposes only. 3/8-inch ID flexible rubber chemical resistant spray hose Multiple supplier sources. Some sprayers ship with flexible hose, others with rigid. Replace rigid hose with this flexible hose. 29 psi – blue It’s important to note that only the 11/16-inch thread size will work with the TeeJet spray handle parts conversion. When ordering CF valves make sure to choose the 11/16-inch thread size -or- the 3/8-inch BSP thread size with 3/8-inch to 11/16-inch adapter. If the product thread size is not specified, ask before ordering. Specify matching psi The catalog includes strainers with and without check valves/no drip; check valves are springs inside the screen. When using a CF valve, the check valve prevents dripping when the trigger valve is off. If you are not using a CF valve it’s recommended to use strainers with a check valve. TeeJet Item number 4193 A–PP–50 mesh is the polypropylene version with the 50 mesh screen useful for most backpack sprayer operations. If you’re using a very small nozzle it is recommended to use a 100 mesh screen. The screen size in the TeeJet catalog is listed for each nozzle size. The screen size must be slightly smaller than the nozzle opening to prevent clogging. 4-inch barbed swivel – 11990-61 ~$17.66 While this item is not listed in the catalog, it is available and highly recommended to reduce arm fatigue by preventing hose from twisting. Trigger valve – brass – 6466 ~$52.71 Two versions are listed on the part sheet from TeeJet. The plastic version [B22650 – PP – ¼] is preferred over the brass  and is significantly less expensive. Be sure to order the proper item number as listed in the parts sheet to ensure the correct thread size. 24-inch brass curved extension – 6671-24” ~$18.07 These extensions come in various lengths and designs. We’ve found the 24-inch nonadjustable curved to be the best all around. Quick TeeJet 11/16-inch nozzle body – QJT-NYB ~$5.25 Be certain to order nozzle bodies only in 11/16-inch thread (there are other thread types listed). Turbo FloodJet – TF-VS2 or VS3 ~$13.56 Good for broadcast spraying, the Turbo FloodJet produces larger droplets in a wide-angle spray and does not readily clog. TeeJet spray tips Many different spray tips are available. See catalog descriptions for their use, including standard adjustable spray nozzles. Quick TeeJet caps – 25600-NYR ~$1.22 Be sure to order the correct item: this is the version without a notch that allows proper alignment of the spray tips – using a single nozzle there is a need to rotate the nozzle within the nozzle body. Do not purchase other designs with notches. Also, order extra rubber seal gaskets, item CP 18999–EPR, as they have a habit of getting lost. for spot treatments Do not use an extension with this MeterJet Spray Gun, it will not work properly. Also, see Comments on MeterJet Spray Gun Calibration. Sprayers with large internally mounted piston pumps are more efficient. An internally mounted pump that leaks is much better than an externally mounted pump that leaks, reducing your exposure to pesticides. Leveraging pump handle designs reduce arm fatigue operating the pump. Lightweight tank design and carrier system to reduce overall weight. Large fill spouts offset to the side to allow for easier filling and pouring out of products along with a pickup handle in the middle of the sprayer which is a nice addition to handling a fairly heavy item when filled with solution. Gate pressure regulating valve manufacturer source changed to Gate CFV, www.gatecfv.com, April 2015. Expect worldwide manufacturing of sprayer brands and models changes over time; consult manufacturers for the latest information. As of 2013, the Shindaiwa SP415 shown on the videos, and a very efficient backpack sprayer in our evaluations, is no longer sold. Jacto model SP416 is a new model in 2013, with similar specifications and performance as the Shindaiwa SP415. The Jacto SP416 has a new trigger valve that accepts the 24-inch TeeJet brass extension shown in our materials list. Adding TeeJet trigger valve and valve handle, while not a necessary accessory, enables use of the TeeJet barbed swivel, improving the spraywand balance and user comfort. H.D. Hudson offers a sprayer, model 93594 RegulatorTM Bak-Pak® Poly 4 gal, which is similar in features to the Jacto SP 416 but requires complete spray wand replacement for TeeJet conversion. Also offered is a good quality rechargeable battery powered backpack sprayer, NeverPump® Bak-Pak® Sprayer Model 13854. This handout will help in determining your sprayer output which can be used along with the legal recommended application rate to calculate the mixing rate for accurate product application. The instructions assume your backpack sprayer is set up with a CF valve as shown in the companion videos, and utilizes a TeeJet nozzle which have gallons per minute (GPM) as specified in the products catalog. Calibration is determined by three factors: maintaining constant spray volume, maintaining constant walking travel speed, and maintaining spray width by holding boom at constant height. Maintain constant spray volume. Using a CF valve with TeeJet nozzles maintains constant spray volume, greatly simplifying calibration. You may extract the nozzle spray GPM specification from the TeeJet catalog to use in the calibration formula provided here. However, we recommend that you measure the nozzle GPM using the following method rather than depending on the spray nozzle catalog. Your measured conditions may provide a different flow rate accounting for variation, worn, or defective spray nozzle tips. You will need the following items to measure the flow rate: measuring container (units of fluid ounces); sprayer with CF valve and chosen nozzle; and a stopwatch. – Half-fill the sprayer with water and a colorant. – Pump the sprayer; release the hand trigger and timer. – Hold a measuring container under a nozzle for 1 minute, collecting its output. Example: 32 fluid ounces caught in 1 min is a flow of 0.25 GPM (32 ÷ 128). If you build a spray boom with more than one nozzle, measure output for each nozzle. Calculate the total sprayer output by adding the output for the nozzles. Most nozzles will have a slightly different output, but the variance should not exceed +/- 10 percent. Replace worn or faulty nozzles if the output is 10 percent more or less than the manufacturer’s specifications. Practice and record a constant walking speed. Mark off 100 ft on the ground that you will be spraying. Your time to travel 100 ft should be paced to match 1st column times, and your walking speed in MPH can be read from the 2nd column. Maintain spray width by holding boom at constant height. Walking with a constant height above the target maintains uniform width. The spray tip catalog specifies some effective nozzle width calibration information (typically 20″ or 30″), but your width may not be listed in the catalog. If so, measure the width yourself: hold the boom at a constant comfortable height, leaving edges for spray overlap, then measure the width. Determining your width and using it in the formula provided assures your width is customized to your specific application, such as spraying the width of a bed or width between rows. “Nozzle GPM” is the measured nozzle flow rate in gallons per minute. “MPH” is your walking speed while running the sprayer in miles per hour. “W” is the spray width created by the nozzle, in inches. Note that “136” in the equation is a constant value needed for conversion of mixed units (feet, miles, and acres; minute and hour). Products have legal recommended application rates. Determine the product mixing rate (in pounds, ounces, or fluid ounces per gallon) with water in the backpack sprayer tank by dividing the product application rate (AR) found on the label, by the sprayer output in gallons per acre (GPA). Note that product application rates specified in pounds, ounces, or fluid ounces per 1,000 square feet need to be converted to pounds, ounces, or fluid ounces per acre. Multiply pounds per 1,000 square feet by 44 to convert to pounds per acre. Determine the mixing rate for a backpack sprayer under the following conditions for accurate product application. Treat crop rows on plastic mulch; there are 10 single rows of a crop on plastic mulch 250 feet long. The crop protection product label recommended application rate is 1 pint (16 oz.) per acre. Your practiced walking travel time is 2.5 MPH. The backpack sprayer is equipped with a TeeJet nozzle with 0.2 GPM output flow with 20 psi CF valve and 20” width. by Thomas Reed, Spraying Systems Co., Wheaton, Ill.
Nozzles are the unsung heroes of the spraying industry. Despite their small size, they regulate the spray flow, droplet size and spray pattern. Proper selection and operation of spray nozzles are important steps in precise application. Flow regulation is extremely important because it affects the application rate. The nozzles are designed so that the pressure must increase four times in order to double the flow rate through an orifice. Therefore, orifice (nozzle open-ing) size and spray pressure are key features affecting the flow rate through nozzles. You can vary these factors by selecting a different nozzle size or ad-justing the pressure. Viscosity (the ability of a liquid to flow), liquid density and surface tension are additional factors affecting flow rate. However, it’s more difficult to change these characteristics unless you add adjuvants to the tank solution. Droplet size varies due to pressure, climatic conditions and nozzle size. The size may be affected by the spray angle and the spray pattern shape (nozzle design). Increasing pressure at the nozzle decreases droplet size in a conventional system. Increasing the spray angle of the tip also decreases droplet size. As nozzle (orifice) size increases, there is a corresponding increase in droplet size. 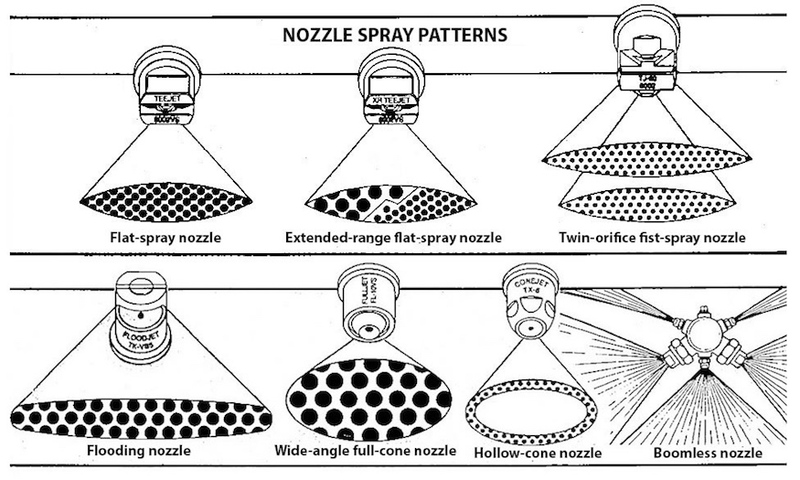 Nozzle spray patterns are comprised of three basic shapes-flat-spray, hollow-cone and full-cone patterns. The characteristics of each spray pattern favor certain chemical applications. Spray droplets from a flat-spray tip form a fan-shaped pattern as they leave the orifice. The edges of the pattern have a lower spray volume, so patterns of adjacent nozzles must overlap to obtain uniform coverage along the spray boom. Proper overlap is one-third on each edge of the spray pattern. Look in nozzle manufacturers’ catalogs for tables that provide data on the spray tip height required to achieve proper overlap. Flat-spray tips are commonly available in 65°, 73°, 80° and 110° spray angles. Wider-angle nozzles produce smaller droplets, but they can be spaced further apart on the spray boom or operated closer to the target. Narrow-angle spray tips produce a more penetrating spray and are less susceptible to clogging. 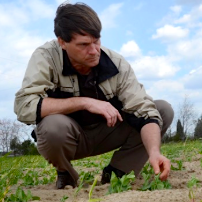 Flat-spray tip characteristics make them ideal for broadcast applications of herbicides when uniformity is critical. Typical operating pressure should be 30 to 60 psi for the most uniform coverage. Lower pressure will reduce drift, but it also may cause less uniformity along the boom. Specialty types of flat-spray tips are also available to turf managers. A new type of nozzle called the extended-range flat-spray tip was designed to provide better spray distribution over a range of spraying pressures from 15 to 60 psi. At low pressures you can uniformly apply systemic herbicides with reduced drift risks. You can use higher pressures for contact herbicide applications. The twin-orifice flat-spray is designed for applications requiring thorough spray coverage and good spray penetration. The spray tip has two orifices that direct one flat-spray pattern 30° forward and the second spray pattern 30° to the rear. By atomizing with two orifices, the droplet size is smaller than an equivalent-capacity standard flat-spray tip. The smaller droplets increase coverage potential and make the nozzle suitable for applying contact herbicides. Typical operating pressure is 30 to 60 psi. Another type of flat-spray nozzle is the LP or low-pressure flat-spray tip. This nozzle operates at lower pressures (15 to 40 psi). Larger orifices and lower pressures provide larger droplets that reduce drift and minimize clogging. This makes the tip especially well-suited for applying systemic herbicides in sensitive areas. The flooding nozzle produces a wide, flat spray pattern when the liquid atomizes as it leaves the edge of the nozzle. The wide spray angle (110 to 130°) allows wider nozzle spacings and lower boom heights in broadcast applications. Both the wider spacings, which allow a larger orifice, and the round shape of the orifice make the nozzle less susceptible to clogging. Spray horns are the higher spray volumes that typically occur at the edges of the spray pattern. These heavy edges require you to double overlap adjacent spray patterns to optimize broadcast uniformity. Angling the nozzles at 45° also improves the uniformity of coverage. Typical operating pressure is 10 to 25 psi. The wide-angle full-cone nozzle produces large droplets that are distributed uniformly in a full-cone pattern. The uniform spray pattern is maintained over a pressure range of 10 to 40 psi. You can use the wide, 120° spray angle on up to 40-in. spacings, as with the flooding nozzle. The droplets from the full-cone tip are larger than other tip styles of equal capacity at similar pressures. This nozzle is well-suited for soil-applied and systemic herbicides. You achieve maximum drift control at pressures of 15 to 20 psi. To optimize broadcast uniformity, overlap spray patterns 30 to 50 per-cent on each edge with the nozzles angled back at a 30 to 45 o angle from the vertical. A hollow-cone nozzle produces a spray pattern with the liquid concentrated on the outside of a conical pattern. The typical spray distribution is saddle-shaped with less liquid in the center of the distribution, tapering off rapidly at the edges. For this reason, the hollow-cone nozzle is not well-suited for broadcast applications because proper overlap is difficult to achieve. Hollow-cone nozzles generally produce the smallest droplets of any nozzle type. You generally would use a hollow-cone nozzle to apply insecticides, fungicides or growth regulators where penetration and coverage are critical. Spray drift can be high because of the many small droplets produced at the typical operating pressure of 40 psi and above. In some areas, the terrain or obstructions make it difficult or impossible for you to operate a boom sprayer. Typically you would use the boomless or cluster nozzle in these situations. This compact nozzle assembly mounts at the rear of the sprayer and can deliver a spray swath 30-to 60-ft. wide, depending on pressure and capacity. The nozzle assembly, consisting of up to five separate nozzles, produces a wide flat-spray pattern. Atomization is as fine as possible in relation to the distance the spray must travel to the outside edges of the swath. You can use angle mounting to allow a lower nozzle height, therefore decreasing the effect of wind driftage while maintaining the swath width. Spray distribution is not as uniform as with a boom sprayer; however, double-overlapping swaths can compensate for this to some degree. Keep in mind that this doubles the application rate and increases spraying time. Hardened stainless steel is the most wear-resistant material and, though ex-pensive, it is probably your best long-term investment. Stainless steel nozzles have excellent corrosion and abrasion resistance. Thermoplastic tips have good abrasion resistance, but swelling can occur with some chemicals. You also can easily damage them when cleaning clogged orifices. Brass tips are relatively inexpensive but wear rapidly with abrasive mixtures, and some liquid fertilizers corrode brass tips. The abrasion and erosion of orifice material is determined by four factors: the orifice shape and size, spraying pressure (velocity), spray liquid (abrasive media) and nozzle material. Applicators introduce other variables that affect wear life, such as changes in chemical sprayed, pressure changes, differences in water quality (suspended solids) and tip maintenance methods (tip cleaning). All of the variables suggest that it is extremely difficult to predict the useful life of a spray tip. North Ave. at Schmale Rd. Accurately filling backpack sprayers with the appropriate amount of pesticide is a critically important task. 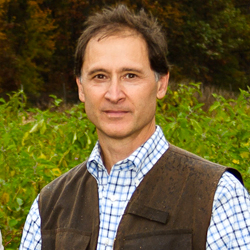 Measuring small quantities and reducing exposure to pesticides during filling is important. Plastic disposable syringes with long extension tubes allow reaching into various size liquid pesticide containers to withdraw the appropriate amount of pesticide in small quantities and transfer sprayers. Trying to fill small measuring cups with large containers of pesticides and rinsing measuring cups is a less than ideal method for filling backpack sprayers. For dry materials use a quality postage scale or the measuring cap which came with the pesticide. These links provide examples of items needed to safely measure small quantities of crop protection chemicals. Measure and transfer crop protection materials from large product containers into backpack sprayers using syringes and extension tubing.